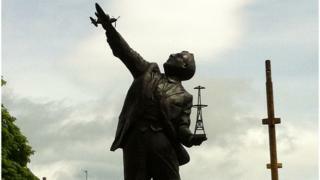 A statue has been unveiled in Brechin dedicated to Sir Robert Watson-Watt, the pioneer of radar. The Princess Royal unveiled the statue to mark the anniversary of the outbreak of World War Two. The radar system Watson-Watt helped develop was described as Britain's "secret weapon" in the war, and was credited with winning the Battle of Britain. The statue has been raised by the town's Robert Watson-Watt Society. It took the society eight years to raise the funds for the statue, which aside from a plaque near Daventry marking the first successful radar test is the only memorial to Watson-Watt. Born and raised in Brechin and later studying in Dundee, Watson-Watt - a descendent of James Watt, the inventor who improved the steam engine - was initially approached by the British Air Ministry about the feasibility of developing a "death ray". Instead he successfully bounced a radio wave from a BBC short-wave transmitter off a Heyford bomber, proving that radar detection could work. Installed as superintendent of the Bawdsey Research station in 1936, Watson-Watt and his team went on to track aircraft at distances of up to 100 miles, developing the "Chain Home" series of radar stations along the south coast of England, which proved crucial in warning of Luftwaffe attacks. Midlothian-based sculptor Alan Herriot said he had designed the statue with the pioneer's wartime achievements in mind, with Watson-Watt depicted holding a radar tower and a Spitfire plane. As well as the statue, Sir Robert has also been immortalised in a film, portrayed by comedian Eddie Izzard. Castles in the Sky was featured at the Edinburgh Film Festival and is to be broadcast on the BBC.